The first winter after I learned to knit, I thought it would be really stupid of me to purchase a knit scarf when I could make one as good as -or better than- any one that I'd find in a store. So, I knit one. And I've made most of my winter scarves ever since. I would only purchase a scarf if it was so unique that I MUST have it. This year's scarf is FINALLY going to be the DNA scarf. 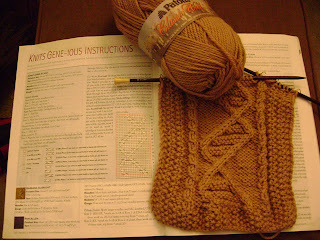 I've wanted to knit this scarf for myself for years but I never got around to it. I made one as a gift for an intern who worked in the lab with me. Believe me when I say that it was very difficult to give that scarf away. I wanted to use my skills as a highly qualified ninja to sneak into his house and steal the scarf back. It was designed by a scientist/knitwear designer named June Oshiro during a biochemistry lecture and was featured in the Fall 2003 Issue of Interweave Knits. It's originally knit in sport weight yarn on size 2 needles. I chose to use Patons Classic Wool worsted weight yarn with size 8 needles. You can find the scarf pattern for free here.